Our Foundations is step 3 of our 5 easy steps for airbrush Makeup. 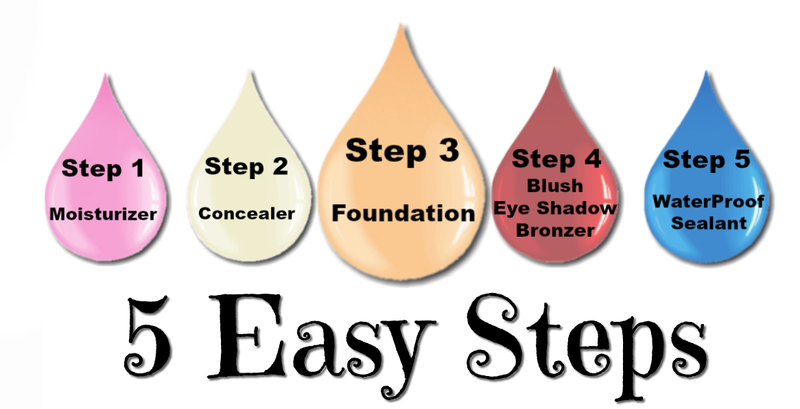 Include a Moisturizer, Concealer, Blush, Eye Shadow, Bronzer and WaterProof Sealant to complete our 5 easy steps. Our Aloe based liquid airbrush foundations are truly unique. We have created an amazing, one of a kind liquid airbrush makeup, that is not only high in antioxidants, but is also packed with ingredients that are shown to do wonderful things for the skin. Shake well before use. You can mix and blend any of our colors to create your own custom colors right in the gun. You can even mix the foundations with the eye showdows and blushes if needed. No warranty applicable to cosmetic makeup products. I really love the foundation, just wish it was a little bit cheaper. I have very sensitive skin, and the aloe foundation works great. I love the coverage without breaking out in a rash. I love the new size. I mix two foundations together to achieve the color I am looking for. The product mixes very well. I love this foundation!!! Its the best airbrush foundation I have ever used, Looks great all day long with no heavy feeling or settling in lines. Well done Tickled Pink!! This is an excellent product, however I bought the wrong shade. I will be getting one closer to my skin color and will be better able to assess it. I would recommend this to others. The price is excellent compared to other airbrush foundations. I like it; however, I do wish it lasted longer. LOVE this spray makeup !